… They’re cute, aren’t they? Undeniably so! These bears will soon adorn most of SBCS’ customer-facing areas/units. Yet, beyond their cuddly exterior and the ‘fuzzy feelings’ they evoke, each teddy bear stands as an icon for a worthy, more profound cause. 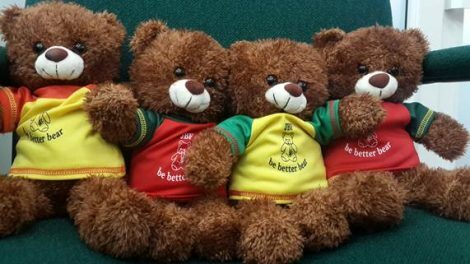 The Just Because Foundation’s (JBF) “Be Better Bears” are symbols of comfort, given to every child diagnosed with cancer and admitted to the JBF Paediatric Specialty Unit. This year, in support of Cancer Awareness Month, SBCS has procured some of these bears for display throughout our campuses – our contribution to the promotion of cancer awareness, and to lend support in the fight against the disease. To find out more about them, or to purchase a bear for your personal tending, visit http://www.thejustbecausefoundation.com.